You know, I am so shy and reserved, I just do not know how I will ever adapt to a new workplace. Meeting people is so difficult. *grin* My new work cubicle is right next to the main door into our area, and I was feeling a little bit abandoned on my first day at the new job, so I took matters into my own hands. Not surprisingly, it worked. 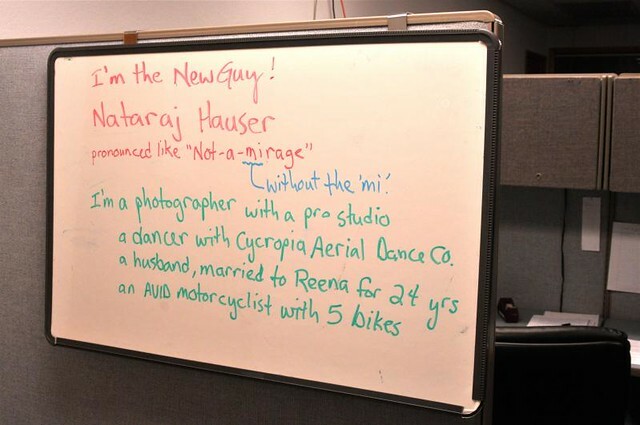 At lunch people asked me about the very things I had on this whiteboard as an ice-breaker. Sometimes an extrovert has to do what an extrovert has to do. And let the nata comments begin anew!